The IT cobbler's kids finally have their own shoes. Some 20 years into enterprise resource planning (ERP), whereby IT made business performance metrics and business intelligence (BI) a science for driving the modern corporation, ERP and BI for IT is finally at hand. HP today unveiled a new suite of software designed to measure and improve IT performance at a comprehensive level via an IT system of record approach. The HP IT Performance Suite gives CIOs the ability to optimize application development, infrastructure and operations management, security, information management, financial planning, and overall IT administration. The suite and its views into operations via accurate metrics, rather than a jumble of spreadsheets, also sets up the era of grasping true IT costs at the business process level, and therefore begins empirical costs-benefits analysis to properly evaluate hybrid computing models. Knowing your current costs -- in total and via discrete domains -- allows executives to pick the degree to which SaaS, cloud and outsourcing form the best bet for their company. HP has identified 150 standard, best-in-class key performance indicators (KPIs), 50 of which are included in the Executive Scorecard as a starting dashboard. KPIs are distributed in customizable dashboards that provide real-time, role-based performance insights to technology leadership, allowing alignment across common goals for an entire IT organization. "With this we can leverage our human capital better," said Alexander Pasik, PhD, CIO at the IEEE, based in Piscataway, NJ. "The better automation you can apply to IT operations, the better. It frees us up to focus on the business drivers." The Performance Suite uses HP's lifecycle approach to software development and management and integrates industry standards such as ITIL. The first solution to be offered in the suite is the CIO Standard Edition, which includes the Executive Scorecard, along with financial planning and analysis, project and portfolio management (PPM), and asset manager modules. This edition automatically integrates data from the modules to provide more than 20 best-practice KPIs covering financial and project health, enabling the optimization of IT performance from a business investment point of view. "Our use of IT is about driving the actual business," said Pasik, who is adopting elements of the suite and looks forward to putting the scorecard to use soon. "We need to measure IT overall. We will have legitimate metrics on internal operations." The scorecard can be very powerful at this time in computing, said Piet Loubser, HP senior director of product marketing, because the true capital expenses versus operations expenses for IT can be accurately identified. This, in turn, allows for better planning, budgeting and transitioning to IT shared services and cloud models. Such insight also allows IT to report to the larger organization with authority on its costs and value. Using the scorecard, said Loubser, IT executives can quickly answer with authority two hitherto-fore vexing questions: Is IT on budget, and is IT on time? What's especially intriguing for me is the advent of deeper BI for IT, whereby data warehouses of the vast store of IT data can be assembled and analyzed. There is a treasure trove of data and insights into how business operate inside of the IT complex. Applying BI best practices, using pre-built data models, and developing ongoing reference metrics on business processes to the IT systems that increasingly reflect the business operations themselves portends great productivity and agility benefits. Furthermore, getting valid analysis on IT operations allows for far better planning on future data center needs, modernization efforts, applications lifecycle management, and comparing and contrasting for hybrid models adoption ... or not. For more information, visit the suite's HP website, www.hp.com/go/itperform. The announcement of the HP IT Performance Suite comes less than a week before HP's massive Discover conference in Las Vegas, where additional significant news is expected. 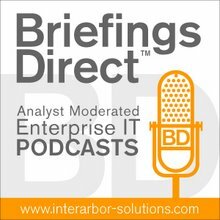 I'll be doing a series of on-site podcasts from the conference on HP user case studies and on the implications and analysis of the news and trends. Look for them on this blog or BriefingsDirect partner site.